3 flying bugs and 24 darts (SRP $29.99). Ages 8+, Available July 2018. Includes: 12 zuru darts, 1 clip, Swarm Seeker blaster (aka Predator, according to the Zuru site), 2 flying bug targets, and 1 launcher. Other notes: Clip is compatible with the Zuru XShot Regenerator blaster, and those clips work with this pistol. 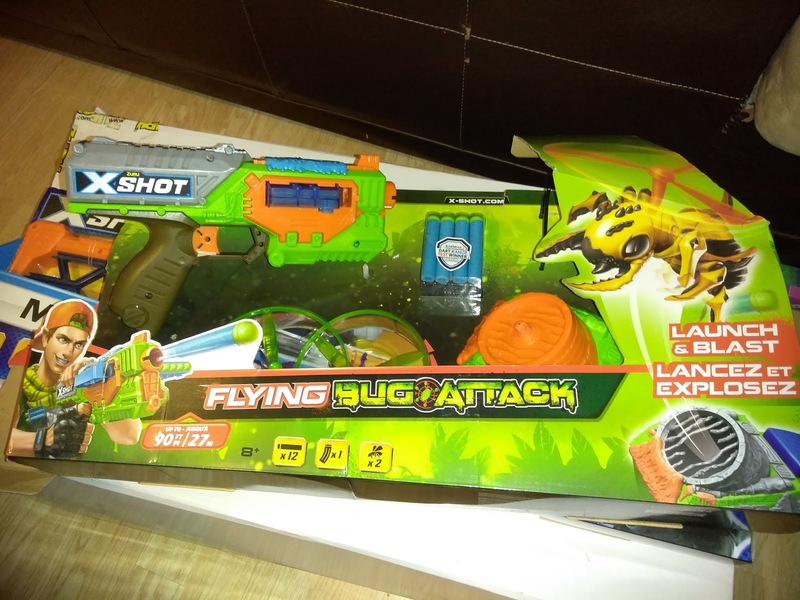 And Zuru is hot off to the races with their newest addition to the Bug Attack line, this time incorporating a helicopter/flying bug target to use with their blasters. The target is easy enough to use; you step on the pedal (video is still being worked on, that will be added in later), rev the rotors on the bug, release, and it flies off so you can shoot it down. The bugs banged into walls and the flying pattern isn’t the easiest to follow, so maybe this will be great fun for target shooting, and higher in difficulty level. The blaster itself is called the Swarm Seeker. It’s a 10 shot clipfed blaster, and the clip is a typewriter/harmonica sideways orientation. Not my favorite placement on a pistol (as I would want to holster it) but the grip is comfortable for me and I didn’t have any jams after firing 3 clips full of ammo. 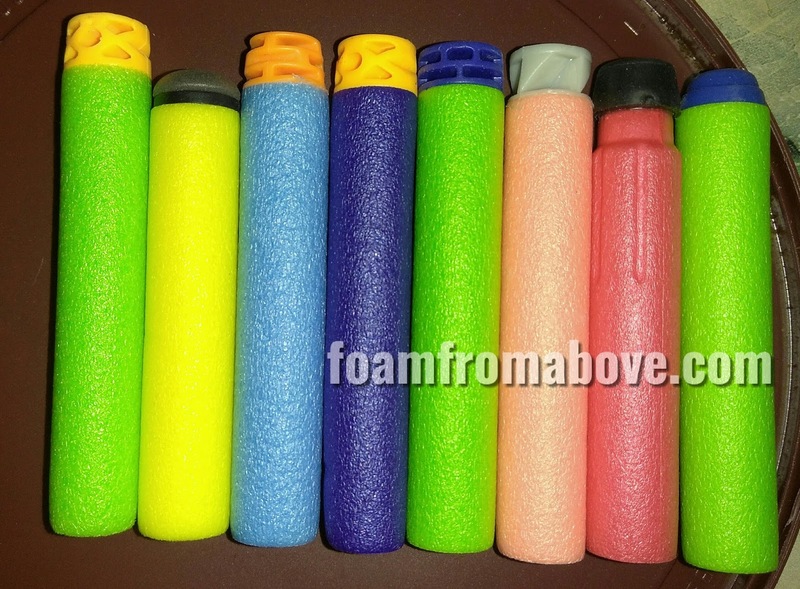 I also launched a few proper Nerf Accustrike rounds from the blaster, and didn’t experience any jams using another brand of ammo. Accuracy from the blaster was pretty decent too, and while some Zuru darts did veer off from a straight line that was the exception more than the rule. As with all Zuru/XShot darts, these are also shorter darts than Nerf or most other brands. The range I got from the Swarm Seeker (video coming later) went anywhere from 40-60 feet. Some of my shots were angled as well, but for a pistol that’s not too bad and for a stock blaster fresh out of the box that’s about what you would expect. The most telling thing about the blaster was that it had some decent accuracy. Zuru dart is second from the left. If I had any strikes against this blaster it’s about the choice to orient the clip sideways. As previously stated, holstering it with the clip loaded is tricky, and the other option is to keep them separated while running around and THEN loading the blaster when you use it (if you decide to keep it as a sidearm). That seems inefficient. 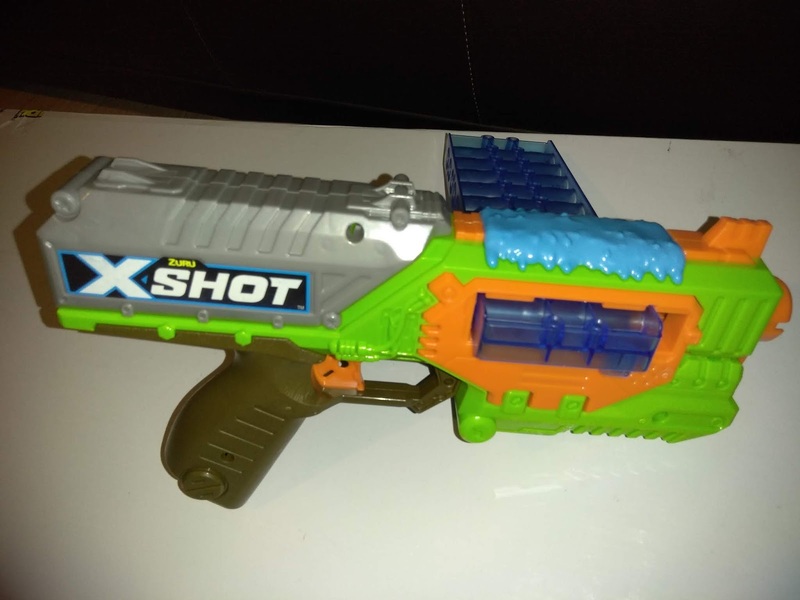 I also didn’t notice a slamfire feature on the blaster, and while that’s not a dealbreaker, I wouldn’t have minded having it there. The clip does make loading faster though (as opposed to one chamber at a time on a front-loading blaster) but only as long as you have loaded clips. Currently the only way to get any additional clips is thrifting, trading, or buying a Regenerator/another Flying Bug Attack kit. Zuru currently does not sell these clips (or the magazines for the Bug Attack Crossbow) separately. Considering Zuru’s past prices, $19.99 for the single kit itself is a deal. 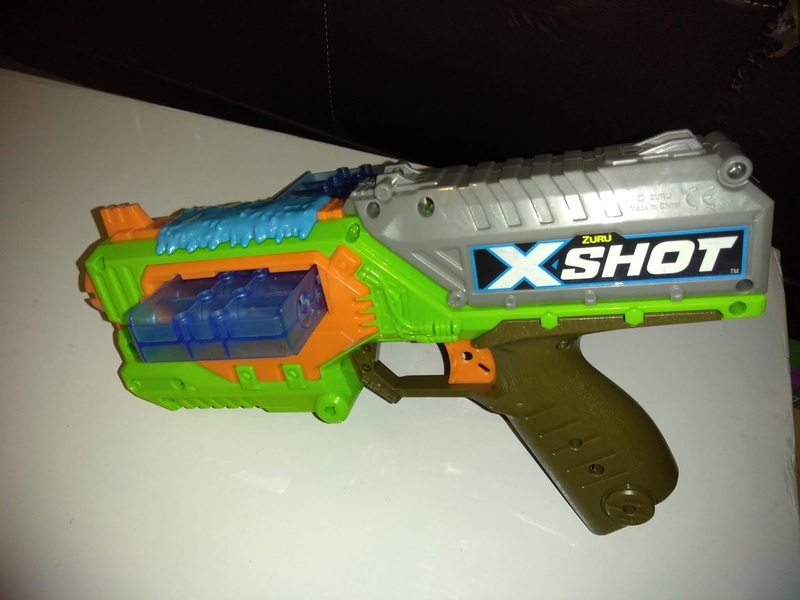 If you consider that a Strongarm on Amazon or most other pistols are about $12 for something that has less shots on a turret, that’s an even better price. If you want to consider the Nerf Recon Mk II, which is a small (when no attachments used) clipfed blaster, it is certainly a lower price but you don’t get the additional value of the launchpad and target, especially if you lack Nerf wars near you regularly. This is certainly a good set for a parent to get their kid(s) with the additional targets, which may keep the darts from flying at siblings and/or furniture. Even more intense players may dig the pistol, which I found comfortable to grip and fire, if not keep as a sidearm. Definitely worth a look once these are widely available later this Fall. Big thanks to Zuru for getting me these samples, and looking forward to more!